We're joining TakladTaMig Cinco, PartnerTaMig? 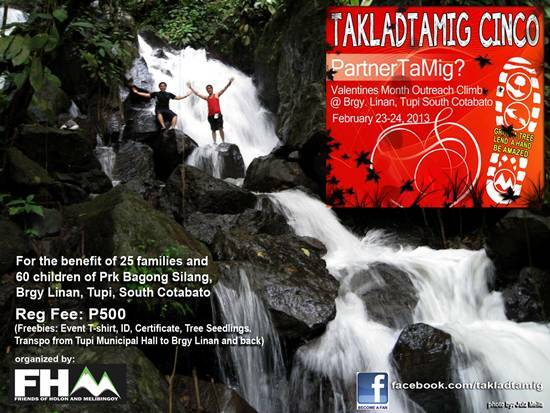 SouthCotabato.Org might be joining the fifth installment of TakladTaMig the popular mountaineering event for a cause in South Cotabato happening this coming February 23-24, 2013. So we are posting here the itinerary, check it out! 9:00AM LET THE RACE BEGIN!! 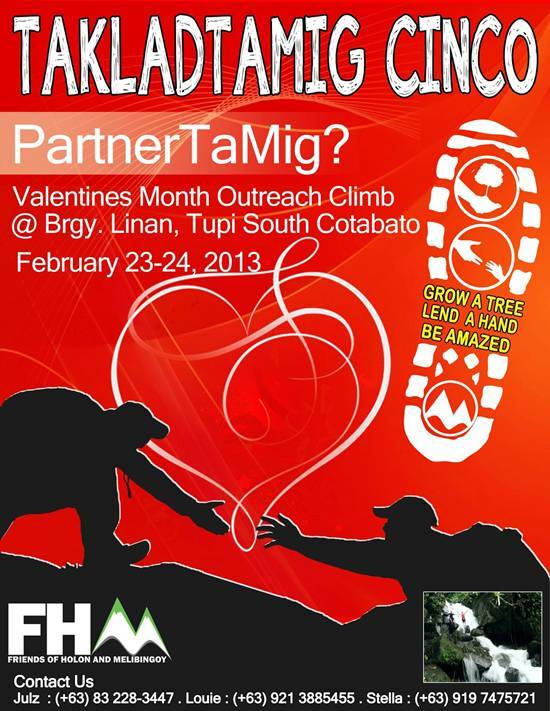 Dubbed as TakladTaMig Cinco Partners Climb: A Valentines Outreach Climb, this mountaineering event will be held in Tupi, South Cotabato. Participants are required to register in pair or by partner. There will be an outreach program in Bagong Silang and a tree planting with the locals. And we're most excited to experience the abundant natural attractions of Tupi, South Cotabato like its springs, waterfalls and Tukay Mal (B'laan term for small monkey) or tarsiers! Registration is at Php500.oo per person inclusive of an event t-shirt, ID, certificate, tree seedlings, transportation from Tupi Municipal Hall and back. For the benefits of 25 families and 60 children in Purok Bagong Silang, Brgy. Linan, Tupi, South Cotabato.